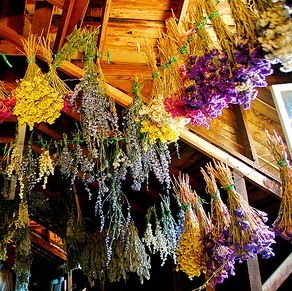 The art of air drying flowers for use in homemade dried flower arrangements has been practiced for centuries. Flower drying is a wonderful way to learn appreciate one of the most beautiful species in our natural world. 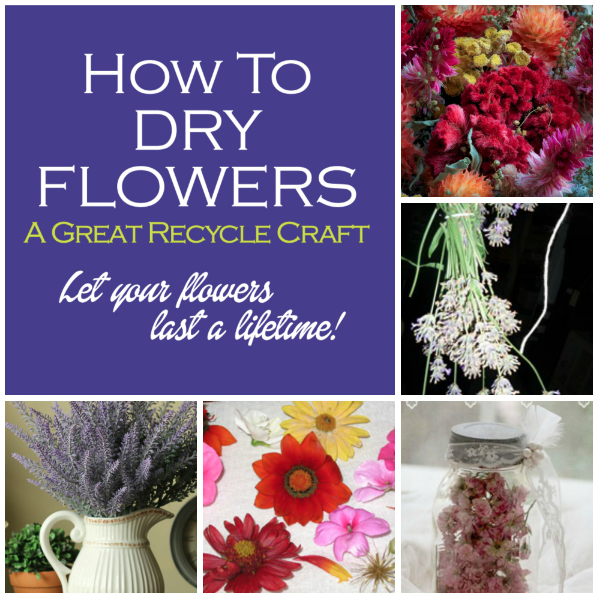 Flower drying can be a recycle craft by recycling books, phonebooks or silica gel. You can also try one of the other techniques listed below. As a nature project, begin with a nature walk to collect the fresh plant materials, including a variety of garden and wildflowers, grasses and seedpods; finish by assembling the dried materials into unique decorations for your home, classroom or for the kids to give as gifts. 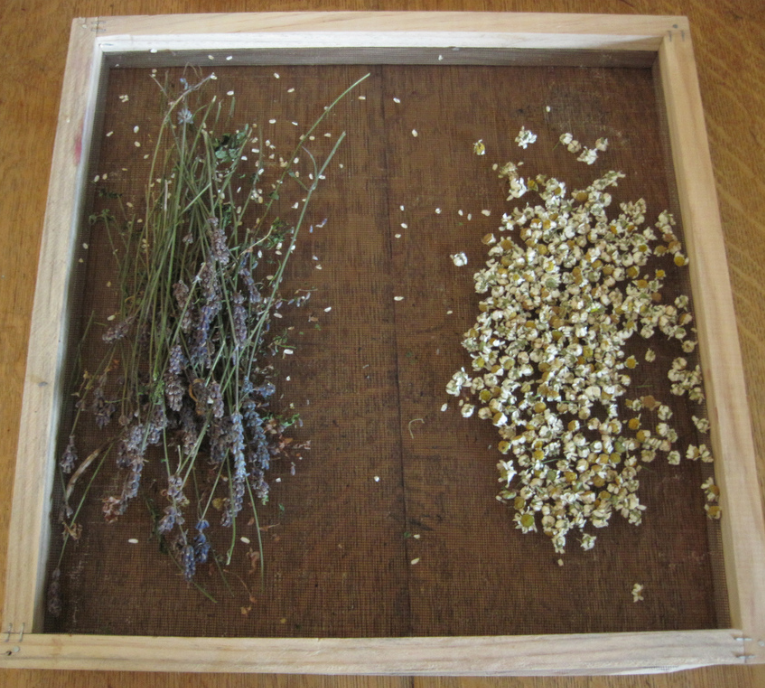 Only experience will tell you when to pick the flowers when they are at their best for drying. A good rule of thumb is just before they are fully opened and matured. Generally, once the flowers are fully open, they will not keep for very long. Tips, Tricks and different ways to dry flowers. 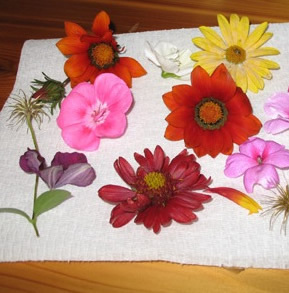 With soft flowers of coarser textured blooms, such as Zinnia, Dahlia, Marigold and Aster, one popular technique for drying flowers is to immerse the flower in desiccant material. 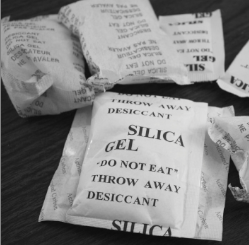 Silica gel (see below), borax or even very dry sand of cornmeal can be used. If each petal and all the floral parts are very carefully surrounded with these granular materials, the moisture will be drawn out, leaving the flower's texture, form and color intact. A microwave oven can also be used for this purpose. Don't forget to smell the flowers! Some flowers with a thinner texture, such as Pansy, Blue Sage, Cornflower and Petunia can be pressed between blotters, books (A great way to repurpose a phone book) , or newspapers, or store bought flower press, until thoroughly dry. This method was pioneered by Linnaeus of Sweden 250 years ago. Amazingly, some of his specimens are still on exhibit in European museums today! You can Air Dry Flowers in Water: Garden flowers that work ourt well this way include perennial baby's breath (gypsophilia), carnations, coral bells, black-eyed susan, dahlias, purple coneflowers, rosebuds, roses and yarrow. You can Air Dry Flowers by gathering a bouuquet and tieing it on the bottom of the stems with wire or string...then hang from a hook. Select flowers a little ahead of their peak bloom and well before any petals began to drop from the flower head. Ideally, pick flowers with a minimum of two inches on the stem; six to 12 inches is preferred for long-stemmed flowers. If possible, avoid flowers on stems with side buds. Make sure your selected specimens are quite dry and free of dew or raindrops; wet foliage or petals causes moldy flowers. Prevent wilting by placing the flowers in a container of fresh water until you're ready to work with them. Pick the most perfect specimens you can find and avoid diseased plants or those damaged by insects. 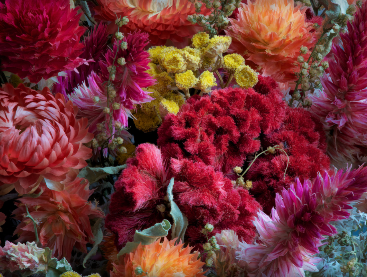 Select the flowers and foliage with an eye to shape and color; brighter colors will remain brighter when dried, while stems with a naturaphoto via Andy Ciordia - FlickrDon Hankinsl arch or sweeping curve lend depth and shape to your dried floral arrangements. Dry more than you think you will need to allow for spoilage or breakage. A great way to repurpose silica gel and learn about the beautiful flowers we have on Earth! Not to mention extend their beauty for a long time. There are other ways to dry flowers and a link below. Cut several flowers for drying. Make sure that the flowers are free of dew, rain and insects. When cutting the flowers, leave only a 1-inch stem. Pour a 1 to 2-inch layer of silica gel crystals into a shallow container or tray. Arrange the flower over the layer of silica gel. Gently cover the flowers completely with more silica gel. Seal the container and leave it for three to four days. 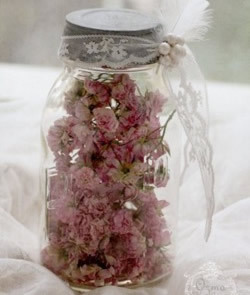 Open the container and remove the flowers very carefully. Brush off any remaining crystals with a paintbrush. Use the flowers for wreaths, decorations and arrangements. AN ALTERNATIVE TO SILICA :THOUGH SILICA IS PROBABLY THE BEST MEDIUM FOR DRYING FLOWERS, A mixture of 2 parts borax and 1 part sand is an effective drying medium. The sand should be fine, clean, and dry. While the sand-borax mix is an effective drying agent, the weight of the sand tends to flatten the flowers. A lighter drying medium consists of equal parts borax and cornmeal. Add 1 or 2 tablespoons of uniodized salt per quart to both the sand-borax and borax-cornmeal mixes to help retain flower color during drying. Drying time for the borax mixtures is approximately 1 to 2 weeks.